AGRICULTURAL RESEARCH ADMINISTRATION BUREAU OF ENTOMOLOGY AD PIA1T QUARANTINE Washington 25, D. C.
subject to State regulation on account of plant .pests. nursery stock into that State, as well as digests of the State plant quarantines and regulations affecting interstate.shipments. An appendix fur-. The information contained in this circular was prepared by Juliet H.
State Plant Board, Gainesville, Florida. Entomology and Plant Quarantine, Washington 25, D. C.
Definition of Nursery Stock.-Palms, orchids, and woody perennials or parts thereof intended for propagation. General Shipping Requirements,--Any person desiring to move nursery stock into Florida should apply to the Nursery Inspector, State Plant Board, Gainesville, for a permit to do so. Application blanks will be provided by the Florida Nursery Inspector. The applicant should furnish with the application a statement as to the location of his nursery, place of business, or location of plants to be shipped, and a valid State certificate of inspection of his nursery or plants. The application should be accompanied by payment for the number of Florida permit certificate tags desired, one of which should be attached to each container or package of nursery stock shipped into Florida. The tags are valid until' June 30 following date of issue; they are serially numbered2 each must be accounted for, and spoiled or unused tags must be returned to the Florida Nursery Inspector. An invoice showing names and addresses of consignor and consignee, kind and quantity of nursery stock in the shipment, and serial number of the tag at-. tached to the shipment should be mailed to the Florida Nursery Inspector. within one week after date of shipment. In case of club orders one permit tag should be attached to each individual order and one permit tag to the package containing the individual orders, and an invoice is required for each individual order in a club order and also for the package containing .such orders. scrubbed with fish oil soap, as specified by Florida requirements, immediately before shipment. Shipments into Florida ports of plants, fruits, vegetables, or other materials likely to introduce injurious plant pests are subject to inspe-. tion and, if apparently free from such pests, they will be permitted to move into Florida. All plants or plant products moving into Florida are subject to inspection, whether certified or not, and if found to have been moved in violation of rules or regulations of the State Plant Board, or if found infested with injurious pests, such plants or plant products must be deported or treated upon order of the Board. Common carriers must notify the Board of any shipment not meeting requirements, which is offered for transportation and delivery, and hold such shipments for instructions. The State of Florida has arranged, under the plan explained in the appendix, for terminal inspection of the following plant materials: Trees, shrubs, and vines (except soft-bodied plants other than sweetpotato plants) or any part thereof. Note.--Shrubs and vines of a woody nature, such as rose bushes, hibiscus, grapevines, blackberry vines, orchids, etc., are subject to inspection, Bedding plants (such as coleus and pansy), vegetable plants (such as cabbage and onion), and strawberry plants are not subject to inspection. "The introduction into this State of any live insect or specimen of any disease injurious to plants, except under a special permit issued by the Board is hereby prohibited." (Rule 30, revised effective Mari 22, 1947)"
Conditions governing movement of citrus fruits0-4he movement of citrus fruits from Arizona and California into Florida is prohibited unless each .shipment is accompanied by State-of-origin certification to the effect that such shipment was prepared in accordance with instructions of the Florida State Plant Board, All shipments are subject to- inspection upon arrival in Florlda. Citrus fruits for food purposes,--Oranges grown in Arizona may be moved into Florida, in carrots or sealed van-type truc.kloads, under permit issued by the Florida State Plant Board, from June 1 through'AuPst 31, Lemons grown in California may be moved into Florida throughout the year, in carlots or sealed .van-type truckloads, under permit issued by the Board end when handled and treated in accordance with the requirements of the Board. Each carrot or truckload of such oranges or lemons must be accompanied by a permit attached to the waybill, or in the possession of the truck driver, and each box of fruit must nave a sticker or stamp identiLying it as part of a permitted shipment. certain citrus fruits intended for food purposes may be admitted under permit, as provided in Rule 30 (see above). Prohibited articles.-Camellia.plants with soil about the roots; camellia flowers, either on the plant or as cut flowers. Restricted articless---Camellia plants free of soil about the roots and without flower buds. Conditions governing movement.---The prohibited articles may not be moved into Florida from the quarantined area. quarantined area when prepared for movement in conformity to this regulation a nd accompanied by valid inspection certificates of the State of origin and of the State of destination, provided that certified camellia plants, with flower buds and without soil, may be moved into Florida when accompanied by statements from duly authorized inspectors of the States of origin that the plants were free of flower buds showing any trace of color at the time the plants were offered for shipment. North Carolina: Brunswick County: That portion lying east of U. S.
Restricted plants and plant products.--Stalks, ears, cobs, or other parts or debris of corn, broomcorn, sorghums, or Sudan grass (except clean seed and grain); green and lima beans in the pod, beets with tops, and rhubarb; cut flowers and entire plants of aster and chrysanthemum; and cut flowers and entire plants of dahlia and gladiolus (except bulbs without stems). Conditions governing shipment.-The movement into Florida of restricted plants and plant products originating in or shipped from the infested area is prohibited unless they have been (1) manufactured or processed in such manner as to eliminate risk of disseminating the borer; or (2),certified as having been officially inspected and found free from the borer; or (3) certified as having been produced in a borer-free area; or (')certified by a State or Federal inspector as having been treated under his supervision in such manner as to eliminate risk of transporting the borer. Winter-grown rhubarb produced in greenhouses located in the infested areas may be shipped into Florida when certified by a State or Federal inspector as having been grown and produced during the normal period for greenhouse production of rhubarb and otherwise handled under safeguards.
.(Rule 52, revised Dec. 104, 1iqr-l' Restricted arti cles. --Rooted trees and seed~ling plants of oak (.UI Crus s. and Chinese chestnut (Castanea mollissima) and anyr parts of' such iilr'nts for propagation except seed. other than the infes-ted States only when each such shirPment is accomianied. by a valid inspection certifl-ate of' the State of origin or of the U. S, Department of Agriculture, affirming (1) that oak iw.ilt i.s not knoi. 'n to oc. cur in si.uch Strte and (2) that the restricted articles so certified are a product of such State or of another State where oak xwilt is not known 'to o-.Cur. Each such certificate should state the name of the State where the restricted articles were prodilced and the kind tand Lumber of nommodtios covered by the certificate. The shipment into Florida of sweetpotatoes and. sweetpotato plants and parts thereof produced in or shipped from areas in other States infested with sweetpotato weevil is prohibited, ex2eptthat sweetpotatoes for food purposes may be shipped into Florida from such infested areas when fumigated as prescribed, under the supervision of an inspector of the State of origin. The foregoing summary was checked and approved on July 11, 1952, by Arthur C. Brown, Plant Commissioner. field-grown florists' stock-, trees, shrubs, vines, cuttings, grafts, scions, buds, fruit pits, andl other seeds of fruit aind ornamental trees or shrubs, and other plants and plant products for propagation, incluclin; strawberry plants (except field, vegetable, anA flower seeds, betting plants and other herbaceous plants, bulbs, ani roots), imay be ~ ittel to the m.iails only when accompanied by a State inspection certificate to the effect that the nursery or premises from which such stock is shipel has been inspected within a year andm found free from injurious insects and plant diseases. Parcels containing such nursery stock: must be plainly marked to show the nature of the contents and the name and ad,r.ss of the sender. (?ostal Laws and Reogulations 1940, sec. 595.) Inspecction end certification must be done by a slant quarantine official of the Sta'tc of origin. An individual mailing of such plants or plant products, if from uninspected premises, will also be accepted upon examination and. certification by a State plant quarantine official. The address of the Flori.da plant quarantine official is given in the preceding sur.,mary. Establishment of Terminal Inspection.--Any Staote desiring to operate under the provisions of the terminal inspection law so as to regulate the movement of mail shipments of plants and plant products into (or within) the State may, after having provided therefor at State expense anA having designated one or more places where inspection will be maintained, arrange to have such mail shipments turned over to State plant quarantine inspectors for examination at designated inspection points. Application will be made to the Secretary of Agriculture by submitting a list of plants and plant products and the plant pests transmitted thereby, which are to be examined. The list, when approved in whole or in part, will bc transmitted to the Postmaster General wheroupon postmasters will be informed and instructed. Anyone mailing a parcel containing any plants or plant products addressed to any nlace within a State maintaining terminal inspection th reof is required, under the law, to have the p-narcel plainly marked on the outside to show the nature of the contents. Materials shipped under Federal quarantine certificates issued by the bureau of -ntomology and Pleant 0,uarantine may be exempted from terminal inspection at the option of the receiving State. 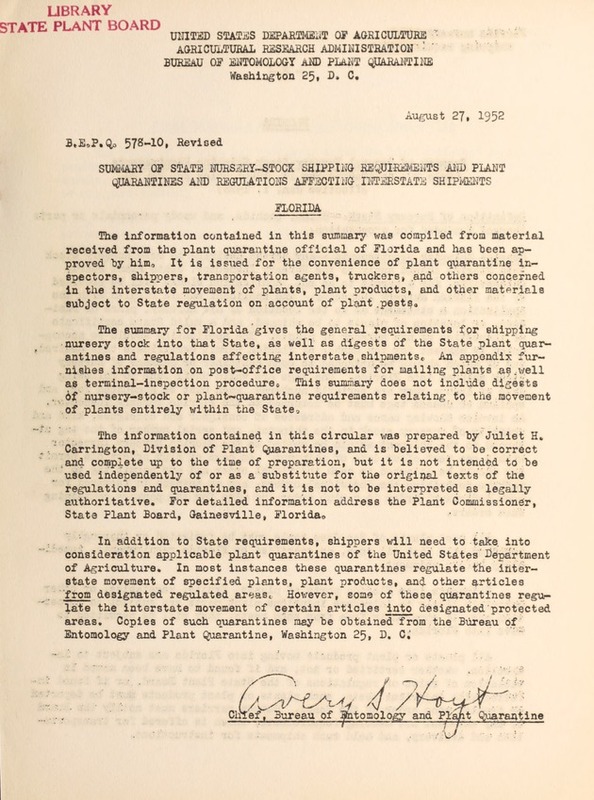 Under the provisions of the 1936 amendment to the law, any State .ay arrange through Federal channels, after approval by the Secretary of Agriculture as indicated above, to regulate or prohibit the movement into (or within) the State of mail shipments of designated plants and 1lant products the movement of which would consitute a violation of Stato plant quarantine laws or regulations. Terminal Inspection Procedure.--Upon arrival in any State maintaining terminal inspection, plants or plant products named on the approved list < @ will be forwarded by the postmaster at destination to the nearest inspection point. If the plants or plant products are found, upon inspec- tion, to be free from injurious pests and not in violation of any plant "
quarantine or regulation of the State of destination or the United States a Department of Agriculture, or if disinfested when they are found infested __4 such plants or plant products will then be forwarded by the postmaster at w the point of inspection to the addressee upon payment of postage. __If plants or plant products, upon inspection, are found to be infested with injurious pests and cannot be satisfactorily disinfested, or are in violation of any plant quarantine or regulation of the State of destination or the United State Department of Agriculture, the postmaster upon notification by? the State inspector will inform the sender that the parcel will be returned to him upon his request and at his expense. In default of such request the parcel will be turned over to the State authorities for destruction. end of the suimary of the general nursery-stock shipping requirements for each of the above-mentioned States, District, and Territories. Procedure for Paying Forwarding Postage.--Methods for paying forwarding a _,ForarcingPotag.--ethds orpaying forwarding postage are p-rovided to expoedite the handling of parcels subject to tarrainal inspection, as follows: (1) The addressee may have the parcels addressed to himself in care of the State inspector at a designated terriinalinspection point in the State of destination and provide the inspector wit' postage for forwarding the inspected plants; or (2) the address may arrange with the sender to place on the parcels a pledge reading, "Forwarding postage guaranteed," whereupon the additional postage for forwarding will be collected from the addressee.